Getting around on the Hawaiian Islands may seem like an enviable problem. The lush wildlife and temperate weather that have made this such a popular vacation spot also provide plenty of motivation to get outside and experience all that the islands have to offer. When you start weighing your transportation options, though, there are a number of personal factors you'll want to keep in mind. 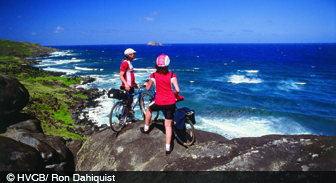 Active travelers may be drawn to the idea of renting a bike or motorcycle while visiting Hawaii. Certainly, there are a number of businesses on every island that can help vacationers find the two-wheeled vehicle of their choice, but caution should be taken by those who opt to rent a bicycle, moped, or motorcycle. Safety is the primary concern, of course, with a high percentage of accidents reported by those unfamiliar with the local layout. Sharp turns, poor road conditions, and unusual traffic behavior are a few of the most common causes for accidents. On the other hand, many of Hawaii's most beautiful areas are in locations that are difficult to reach in rental cars, or expensive or impossible for taxis. The freedom of having a bike or motorcycle at your disposal means that you'll be able to explore all of these hidden gems at your leisure. Because of safety concerns, it may be best for travelers to avoid renting a bike or moped as a primary means of transportation. Fortunately, this doesn't mean you'll have to abandon your dreams of pedaling through the Sandwich Islands; two-wheeled transport is excellent for a daytime excursion, an ideal way to see more of the area while getting in some exercise and enjoying the fresh air. Daily rental rates for bicycles can vary between $10(USD) and $45(USD) depending on the type of bike and availability. Weekly rates tend to be more cost-efficient and might be worth considering if you've got your heart set on exploring the more remote areas of the islands. Guided bike tours are often a good introduction to the area and reservations can usually be made by your hotel. If you're feeling a bit more adventurous, just ask for a map and a good route when renting your gear; most of the staff you'll encounter in the bike shops will be more than happy to recommend a trail and offer advice. If you're looking for something with a bit more power, there are several places on the larger islands that rent motorcycles, scooters, and mopeds to vacationers. As always, safety rules and regulations should be observed and particular care should be taken when riding in an unfamiliar place. Rental rates may come in anywhere from $50(USD) to $150(USD) per day and often there are age restrictions for both renters and riders. Travelers are advised to call in advance and, where available, to make a reservation. Doing so is the best way to ensure that the company will have a motorcycle available when you need one and is also an excellent way to inquire about discounts or weekly rates, which are often considerably lower. Active vacationers will find plenty of opportunities to feel the sun on their shoulders and the wind in their hair by renting a bike or motorcycle in Hawaii. Before you leave for your vacation, become familiar with the basic history of Hawaii.